Whether you are looking for ideas for a special Valentine's Day, a setting for a marriage proposal, or you just want to tell your sweetheart that you love him/her, there is a wonderful selection of potential winning places in the Phoenix area for your romantic adventure. Champagne, piano music and a fantastic array of goodies await you at a unique Sunday Brunch at a historical Phoenix location, The Wrigley Mansion. Yes, William Wrigley, Jr. of the chewing gum fame built this elegant home for his wife in 1931. It was a private club until 1992 when Gordie Hormel bought it and opened it up to the public. Still, because of zoning laws, it must charge a membership fee the first time you visit, so Sunday Brunch will run you about $50. Here are more local restaurants that serve an upscale Sunday brunch. Every evening at the Hyatt Regency Resort at Gainey Ranch in Scottsdale you can take a slow, romantic ride on the waterways at the resort on a gondola. You don't have to do anything but enjoy the ride! The ride takes approximately 10 to 15 minutes. Advance reservations are not accepted, but during peak times the resort operates more than one gondola. Just the two of you (along with your pilot, of course) floating across the Valley sky in a hot air balloon—a romantic adventure! 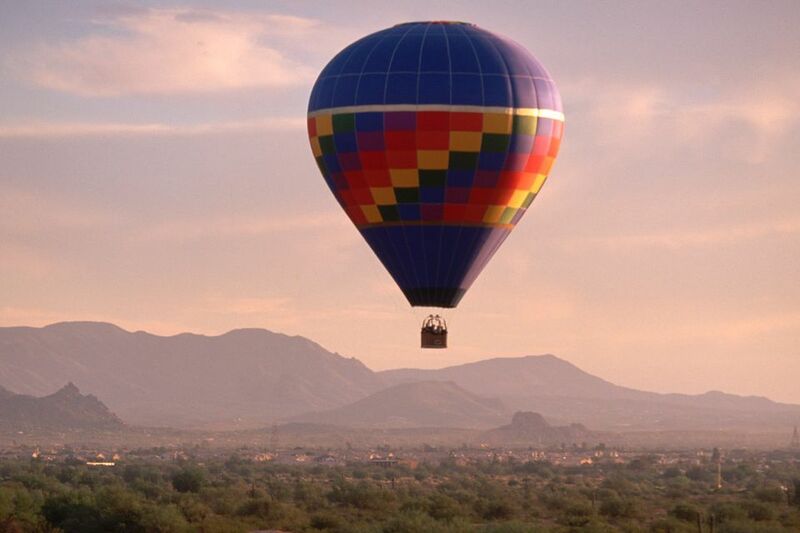 Arrange for a sunrise champagne balloon flight and treat that special someone to a lifetime memory. Enjoy award-winning contemporary American Cuisine on a romantic patio, or by one of the glowing fireplaces located throughout the bar and dining areas. Lon's elegant wood and adobe finished dining room and bar are surrounded by some of the most spectacular scenery Arizona has to offer. Take a romantic peek into the past and have a dining experience not soon forgotten. A one- or two-night stay at The Boulders Resort & Golden Door Spa in Carefree isn't cheap, but this is a special occasion, isn't it? There is no resort close by that can make you feel more like you've traveled to an exotic, romantic destination than The Boulders. There are several packages available, some of which include meals, use of the spa facilities, and golf at one of the most romantic places in the Valley of the Sun. A romantic outing doesn't always have to involve dining and a huge expense. How about a lovely hike to a spectacular view of the Valley? Put on your hiking shoes, sneak some special snacks and a bit of champagne in your backpack, and hike up to the Summit of Piestewa Peak and watch the sunrise or sunset, whichever you prefer! The Top of the Rock is a fine restaurant with a great view and will please for any very special occasion. This restaurant has been voted the best romantic restaurant in the valley and the best place to kiss (in public). Not the shopping mall, silly! Scottsdale Mall. Pack a picnic basket and enjoy a walk and lunch at the park-like setting among the statues and fountains and flowers. Stop in and peruse the art exhibits at the Scottsdale Museum of Contemporary Art. Scottsdale Mall is located in downtown Scottsdale. Located at the Royal Palms Hotel and Casitas in east Phoenix. They serve Mediterranean food in the romantic setting of a Spanish Colonial style mansion. You can expect the meal to be pricey, but the food and ambiance at T. Cook's ooze romance. Take a slow stroll through the Desert Botanical Garden in Phoenix and enjoy the desert flora and fauna on display there. When you are a bit tired of walking, find a bench in a scenic area and profess your love for one another.